Brig. 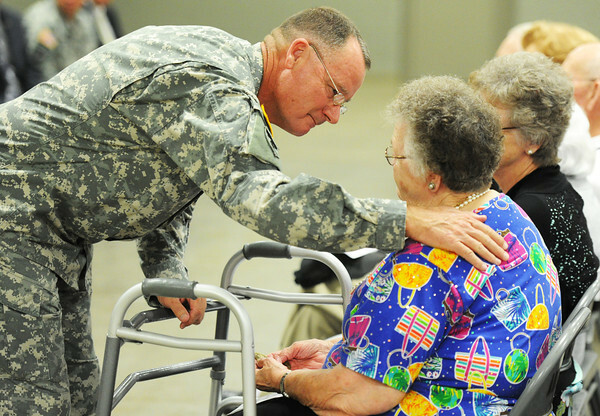 Gen. J. Marty Robinson (left), assistant adjutant general--Army (support), Missouri Army National Guard, pats Wanda Allgood on the back after presenting a posthumous service medal for her husband Tommy Allgood during the Patriot's Day Veterans Award Ceremony Wednesday afternoon, Sept. 11, 2013, at the Missouri National Guard Armory on 32nd Street in Joplin. The event was sponsored by the MOAA Four State Chapter in cooperation with the Guard, the Missouri Veterans Association and the state of Missouri.